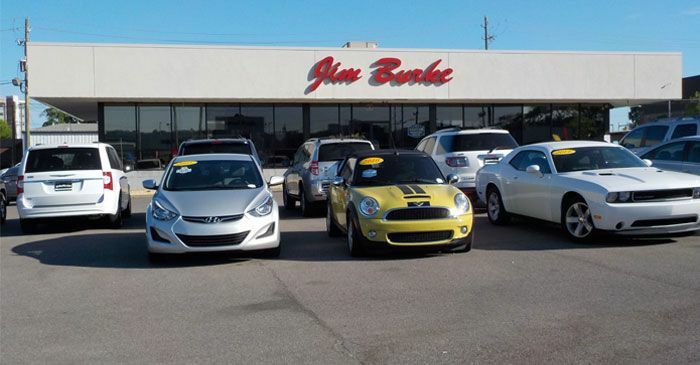 Our used car dealership is conveniently located near Hoover and boasts a large inventory of automotive makes. You can browse through all of your vehicle choices under one roof! Here at Jim Burke Pre-Owned Super Center, we are always on the lookout for stylish pre-owned vehicles that are manicured and efficient. When you visit our team, you'll discover that you may be able to lower those already affordable monthly payments through our trade-in tool. Use TradeVue right now to see what your vehicle is worth! You'll find more than expert servicing at our dealership. We present drivers with an array of quality pre-owned cars, financing options, and genuine OEM parts and accessories. You can conveniently locate information or order parts online through our user-friendly website. It all starts here! We strive to provide drivers near Hoover, Alabama with the best car-buying experience they can have. If you have questions about financing, contact one of our expert financial professionals to learn about your options. We go through various lenders to ensure that we have a higher approval rate. You will enjoy a stress-free financing experience when you purchase through Jim Burke Pre-Owned Super Center. Our location offers a range of automotive services so don't waste your time bouncing from dealership to dealership, instead, head over to see us now! You can easily find premium pre-owned vehicles for sale at our pre-owned super center in Birmingham, AL. We offer all sorts of pre-owned makes and models so you can choose from a wide selection. Whether you're in the market for a used Hyundai Santa Fe or a Mercedes-Benz E-Class we have something for you. If you'd like to go ahead and make the trade and are looking for a little help to seal the deal, talk to our expert finance department today! Our professional staff has assisted drivers from various financial backgrounds so even if you have a less than perfect credit score we can help! You can fill out our secure online credit application right now. Upon receiving your application, our staff will get to work reviewing your material and contacting our lenders. You can sit back and relax — we'll take care of everything. Dealing with the aftermath of an accident? We are here to save the day! You can easily schedule an appointment online with our expert service department! We will go over any structural damage sustained and provide you with an estimate before beginning any work. Your vehicle's health is a top priority, and we have all the necessary equipment to ensure your car, truck, or SUV is up to industry standards. Contact us to get your ride into the capable hands of our service technicians today! We can handle an assortment of repair and maintenance needs so even if you're just in need of a quick tire rotation stop over to our Birmingham, AL location. If you reside in the Jefferson County area, you are in for a treat. Customers love purchasing genuine OEM parts from our pre-owned car dealership in Birmingham, AL. We want to ensure that every vehicle we touch is up to industry standards and that's why we offer top-notch parts and accessories. You can order your parts through our convenient parts order form online! We offer various parts discounts and specials, so please visit our site to see what you could save today. Got questions? Speak with one of our factory technicians. We can inform you of specials, our inventory of OEM parts, and our exclusive factory-backed warranty options!